It's imperative to stay covered when your entire platoon is crawling through the tall grass. It's just as crucial to stay covered when you're wearing army fatigues as a Halloween costume and you and your "platoon" of friends are barhopping while disguised as military personnel. However, when we say "covered" we're not referring to a shield or protection of any kind, we're referring to makeup. This Halloween, look as authentic as possible by coating your face with this camo-colored makeup. The combat hero makeup kit comes with everything you need to look like a decorated soldier. This accessory comes with everything you need in order to create a believable transformation. Use the sponge to make a camo pattern on your face. Outline that pattern in the black makeup with the included mini-brush. Fill in all the shapes you drew with the brown, dark green, bright yellow, and black face paint. 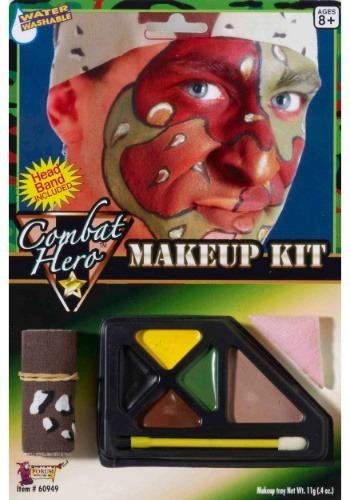 We should note that this combat hero makeup kit also comes with a headband that will work with any costume. You're almost ready to report for duty. Just pair this makeup kit with the navy seal, army ranger, or military general costume of your choosing. We can't wait to salute you.